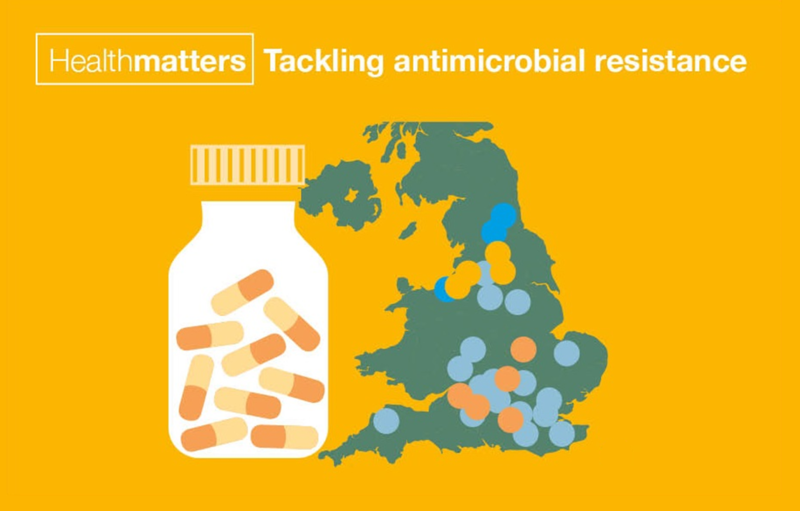 We hope our latest edition of Health Matters – this time covering antimicrobial resistance – will help you and other health professionals by compiling key facts, figures and evidence of effective interventions. Where we can, we’re also committed to answering your questions and taking on your feedback. In this blog we’ve published the answers to a number of Health Matters antimicrobial resistance questions we received from professionals across the UK. Alongside the questions listed here, we’ve also received and answered others direct via email. Is there any evidence that GPs prescribing penicillin (or even amoxicillin) for sore throats, otitis media, coughs etc. are contributing to the emergence of resistance? There is no evidence of increasing penicillin resistance in S. pneumoniae or Group A streptococci, and amoxicillin resistance for H. influenzae has remained static at 15 - 20% for the past 15 years. If we really want to make a difference, instead of concentrating on upper respiratory tract infections, shouldn’t it make more of a difference if we put our resources into stopping unnecessary GP prescribing for urinary tract infections (UTIs), particularly in the elderly? This is where there is a big problem, with increasingly resistant enterobacteriaceae. There are a lot of community interventions out there that have demonstrated reductions in prescribing, which have had a knock on effect in local resistance patterns. Answer: On the question of prescribing for coughs and colds, the issue is twofold. Firstly, any prescribing for these conditions reinforces the belief they are needed. Evidence from primary care randomised trials demonstrate that those who are not prescribed an antibiotic (that they don't need) are less likely to return for the same condition in the subsequent year. Delayed prescribing has a similar effect, only in those who do not take the prescription. Secondly, the meta-analysis performed by Costello et al (BMJ 2010) demonstrated that there was a pooled odds ratio for the development of resistance in those given antibiotics for respiratory tract infections of 2.4. Therefore, we should continue to reduce prescribing when it is unnecessary. I have never seen any convincing evidence to support the notion that not completing the antibiotic course leads to resistance. There is evidence that shorter course, higher dosing of antibiotics is both better in terms of response to treatment and emergence of resistance. Despite this, the British National Formulary (BNF) is recommending homeopathic doses of antibiotics for prolonged periods. What can we do to challenge this? Answer: With regard to not completing the course, again if the antibiotic wasn't needed (as it was a virus) then it should be stopped. There is less evidence related to duration of antibiotic use but there is a current study funded by NIHR that will assess 3 days versus 7 days of treatment for community acquired pneumonia in children in progress. Evidence from studies is continually reviewed and guidance updated. In the hospital setting there is currently a conflict between the sepsis campaign and antibiotic stewardship. For clinicians, management of sepsis always wins, as there is a potential to save lives in the short term. As a result, many elderly patients with other medical conditions that mimic sepsis are receiving empiric broad spectrum antibiotics, which are often continued owing to a lack of a diagnosis. We desperately need a reliable bedside test for bacterial sepsis. Can PHE help with this? Answer: We need to be careful in balancing sepsis with antibiotic prudence. PHE needs to continue to highlight this as an area of required research to NIHR, the Wellcome Trust and other research funders. A key role of hospital infection doctors is to influence the ‘antibiotic review’ decision at 48-72 hours and stop antibiotics if an alternative diagnosis is made. It is an evolving area and we appreciate your support. Answer: Although patients know that antibiotics don't work on most coughs and colds, 20% of the general public still go to the GP with a respiratory tract infection, usually because they perceive their symptoms as severe or prolonged and they are therefore worried. So the TARGET antibiotics patient information leaflet that has been developed aims to help educate patients about how long common infective illnesses last, how they can self-care for these illnesses and when they should visit a health care professional. The personalised leaflet to be shared with patients during a consultation also gives information about antibiotic resistance. This self-care approach will help educate patients, giving them the confidence they need to consider antibiotics less often. At our recent AMR Strategy relaunch event, some feedback around back-up / delayed prescribing included the fact that GP prescriptions can be collected up to six months after they were issued. If a back-up prescription was issued, should there be a two week window during which it can be collected? This should be led nationally if agreed. Answer: Regarding delayed prescribing, FP10 prescriptions have a validity of six months from the date on the prescription (unless the medicine prescribed contains a controlled drug). The prescription can therefore be dispensed by a pharmacist if presented to them within this period. A delayed antibiotic prescription is one of the options outlined in the NICE antimicrobial stewardship guideline for patients who do not require an immediate antibiotic prescription. Given to the patient during the consultation with instructions that it can then be taken to the chemist at a later date if their symptoms do not improve or get worse. Collected at a later date from the surgery reception, if the patient’s symptoms do not improve or get worse. In both cases, the validity will be 6 months from the date on the prescription. We believe the key issue with delayed prescribing is that the patient has a full understanding of the reasons for this rather than closing the collection window. There were calls for a local repository of local data / intelligence and resources that clinicians and professionals can utilise. Professor Anthony Kessel mentioned that a website is in development that will be live next year – are you able to provide further information about this website? It will also contain web-links to sites which contain information and guidance on interventions can support improvement in these areas. This should give local teams a clear picture of what is going on in their area and enable them to make informed decisions about what might need to change to drive improvement. Don't forget to also invest in improving infection control (it’s in the ECDC, WHO and CMO strategies!). Reducing AMR also requires reducing the spread of AMR and this is complicated in the community eg Long Term Care Facilities. (we are an increasingly aged community) and nurseries. Answer: The infection prevention and control (IPC) work stream of the government’s AMR programme continues to work on improving IPC provision nationally as part of the UK 5 year AMR strategy (2013-2018). This includes the provision of two CPE toolkits, for non-acute and acute care, development of an IPC framework across the healthcare economy and contributing to resources that will be available on the AMR portal. This portal will be a unified data source and set of resources available to clinicians and the public, and will contain a single information point for guidance on local action plans to improve Antimicrobial Stewardship and IPC. We held a national teleconference to launch this edition of Health Matters, featuring a live Q&A session. You can listen to this via audioboom. Thank you for your feedback via Twitter. A question posed on a number of occasions was, “why haven’t you discussed antibiotic use in animals as part of Health Matters?” This edition of Health Matters focuses on human prescribing, but animal use is also crucial and a key part of the UK’s 5 year AMR strategy. If you are interested in this area please also see PHE’s ‘one health report: antibiotics use in humans and animals’. Preventing suicide – what can local authorities do?